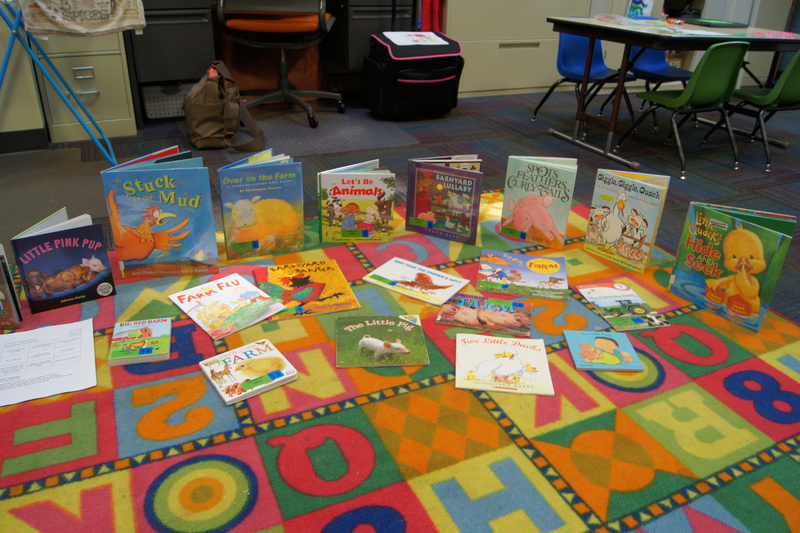 We started with a large number of books on farm animals. I’ll post the complete list soon. 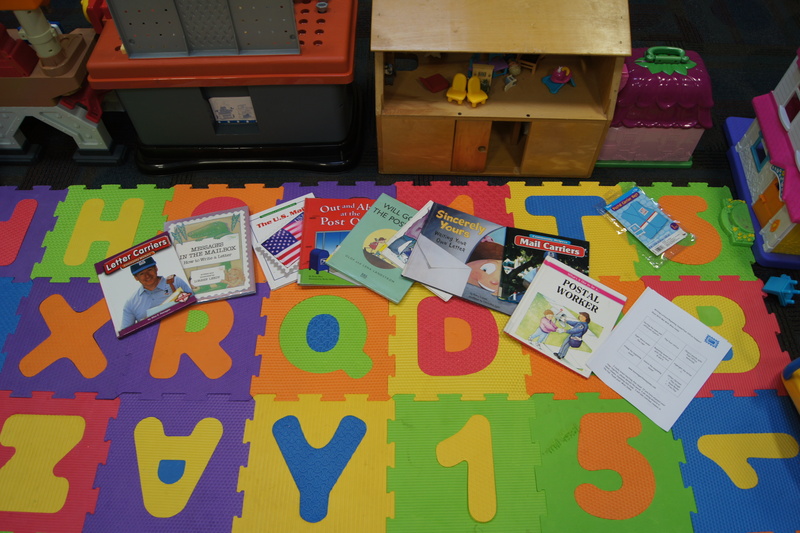 We read Stuck in the Mud by Jane Clarke. It is a really fun book for this age. It features different animals that live on a farm. It has repetition and animals sounds. The kids really seemed to love it! I highly recommend it for a farm unit with preschoolers or just for a fun read. Tomorrow we are learning all about feelings. 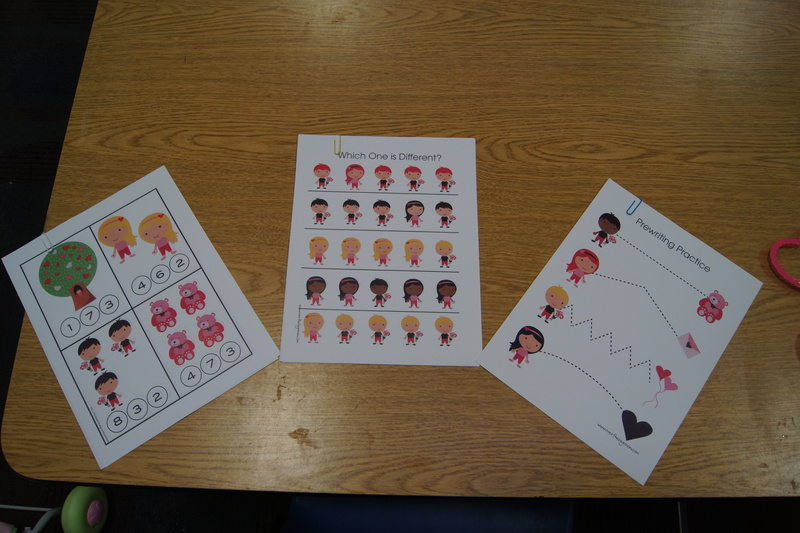 I have created a simple preschool book for the kids to complete on Powerpoint. 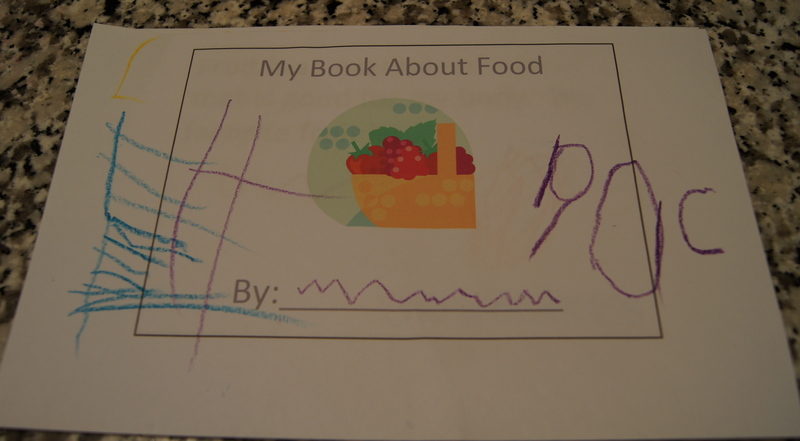 The first page after the cover reads “I feel happy when I ____.” The word “happy” is in yellow and there is plenty of space for kids to complete the sentence and create a picture. Each page has a different feeling. 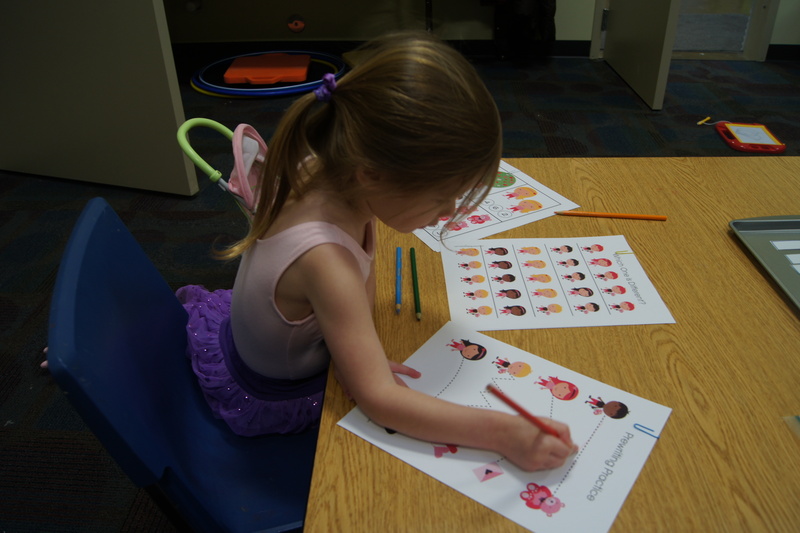 With the kids completing the sentence, they will know in their heads what the words are and will be able to “read” the words on their own. I also hope that this book introduces some more sight words to the kids. If you print the book as is, you will get two copies of the book. 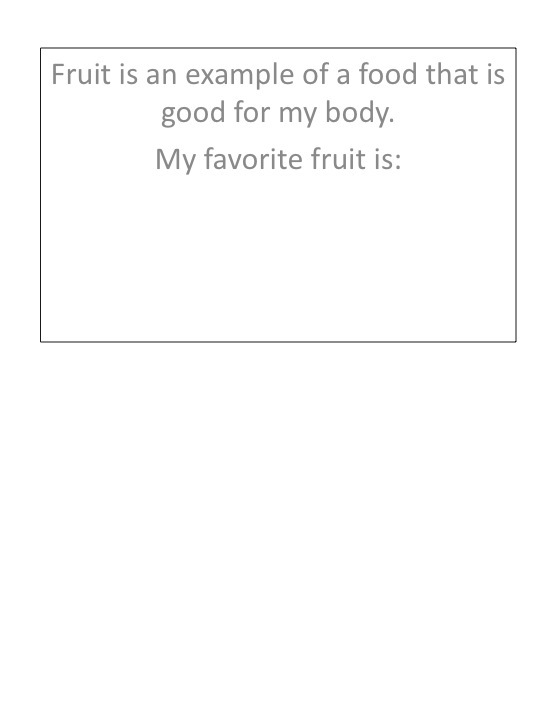 Click here to print out your feelings book! Please feel free to follow me on Facebook and Pinterest! We had so much fun with our rainbow theme! Here is what we did…. 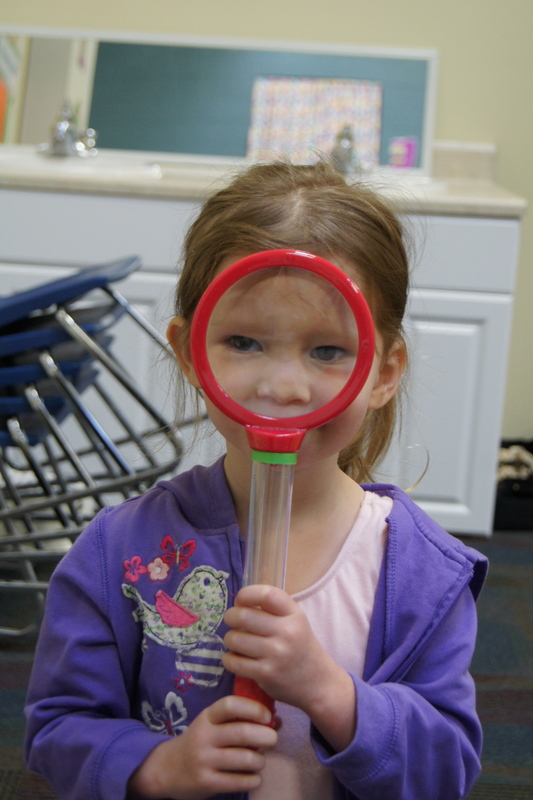 On Monday, we had our class that revolved around the Post Office and writing letters. 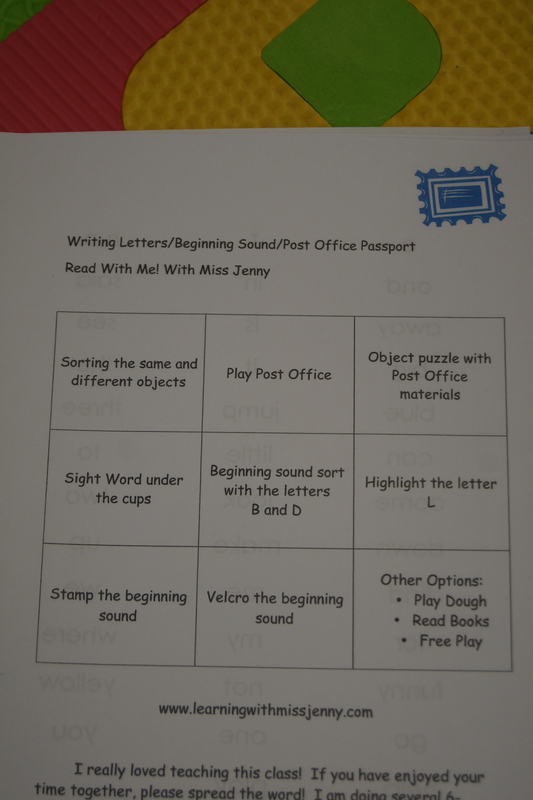 I combined the Post Office theme with beginning letter sounds and sight words. First we skimmed through a book about the Post Office (you can see my list here). 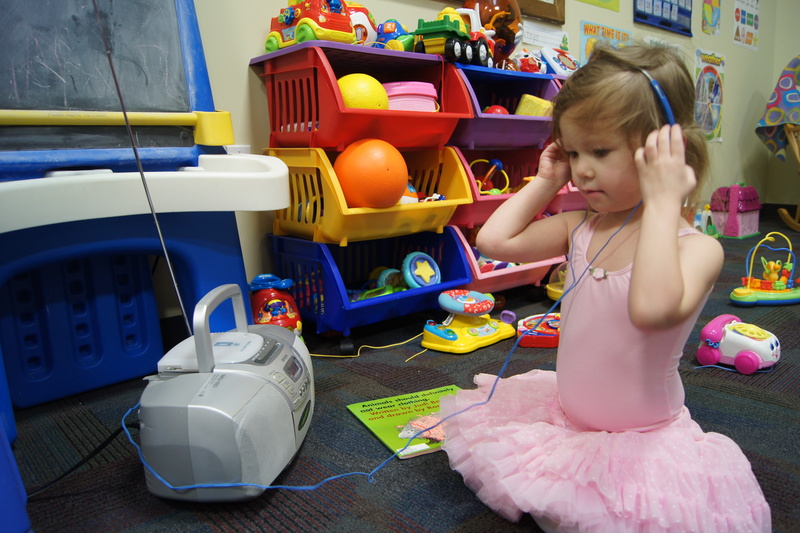 We also sang a couple of songs and then moved on to the learning centers. I, again, made a passport so parents and kids can remember what we did and make sure that they don’t miss a center. 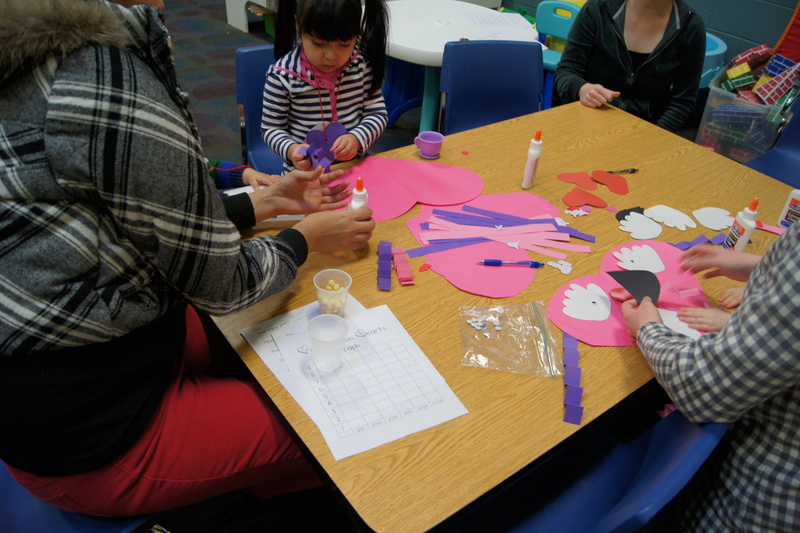 Today we had such a great time with our Valentine’s Day theme! I packed just about as much as I could into our hour and a half. First, we started out with our book of the day. I read, “I Love You Through and Through” By Bernadette Rossetti Shustak (See my review here). The kids really enjoyed this book! After reading the book, we did our gross-motor activity. I wrote different tasks on a bunch of different hearts. 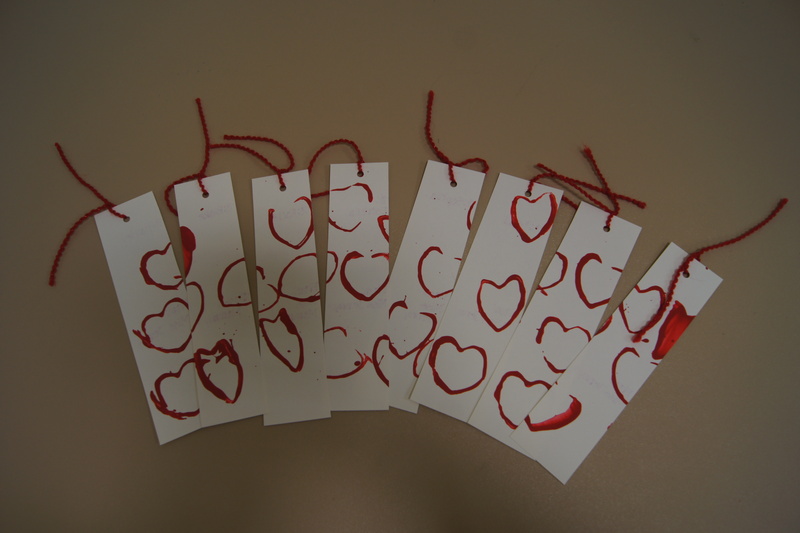 I wrote things such as “waddle like a penguin” and “walk backwards.” I laminated the hearts so they could be reused. I placed the hearts in a circle on the floor. The kids walked in a circle, stepping on hearts, while I played music. 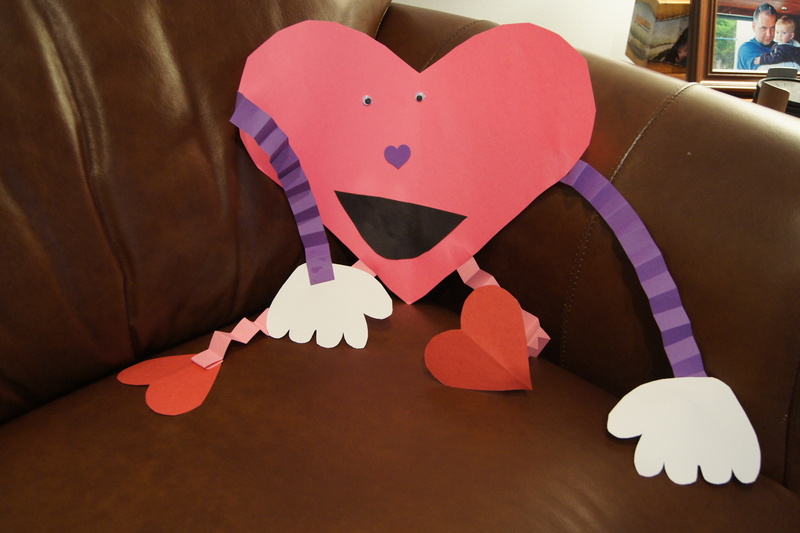 When I stopped the music, the kids stopped, picked up the heart that they landed on, and acted out whatever it said. The kids really seemed to enjoy it, however, it did get a bit confusing when trying to get all of the little ones to walk around the circle (I was too wrapped up in this to get a picture-sorry!!!). I laminated the hearts, which was good and bad. They will last longer after being stepped on, but they were a bit slippery and when we played this later in bare feet, the hearts stuck to us. This activity could easily be adjusted to other themes. 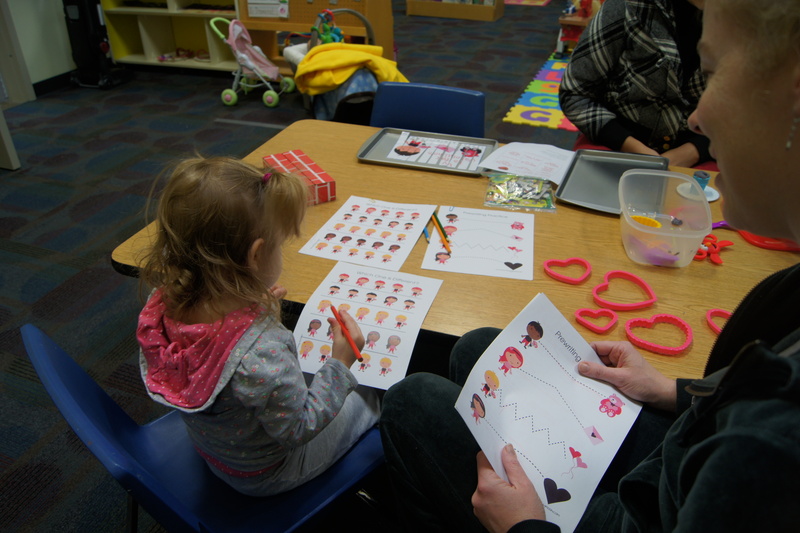 The hearts could be different shapes, the tasks could be reading a sight word or making an animals noise. Complete the Pattern. I found an awesome packet here. 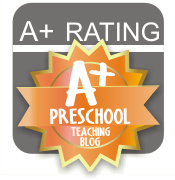 The blog is called Over the Big Moon and it is so awesome! A lot of the different printables I used today, I printed from this site. 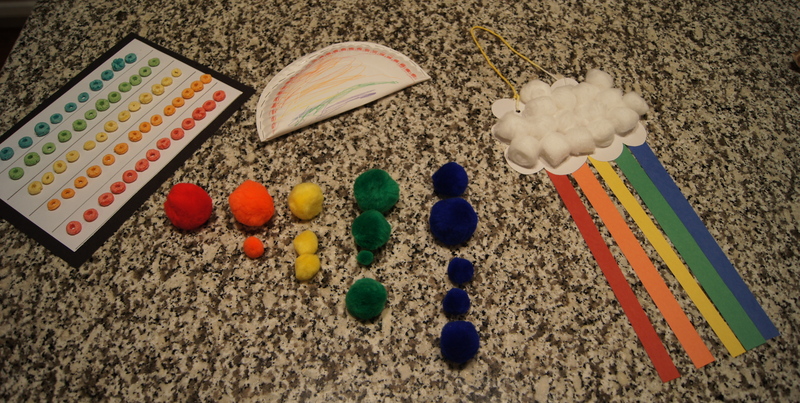 Make a Necklace (Fine-Motor/Pre-Writing Skills). 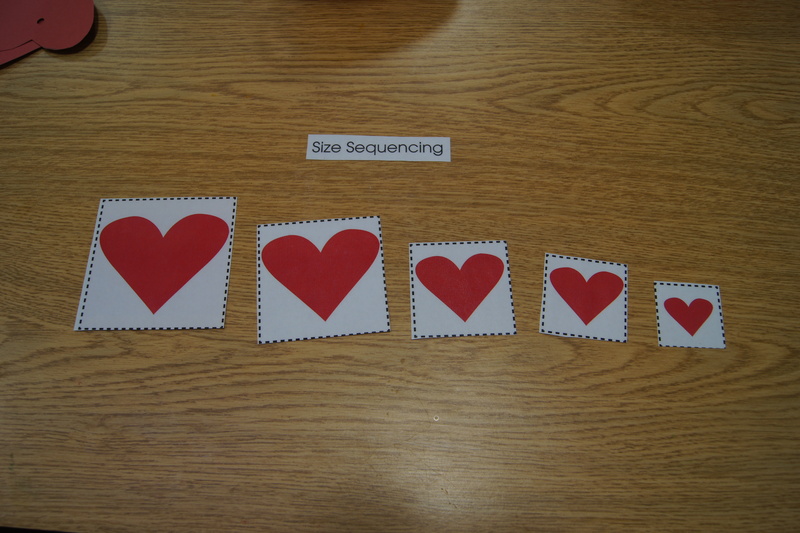 I cut out a ton of hearts and hole-punched them. I also cut some string. 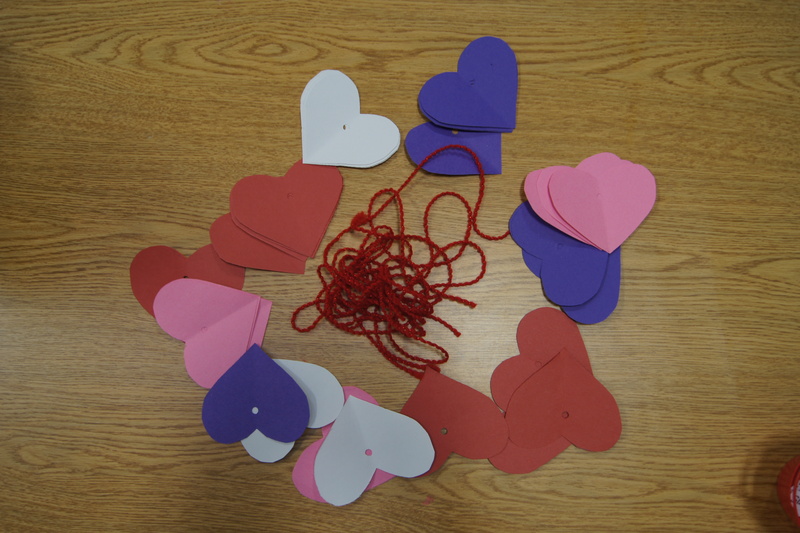 The kids had to put the string through the hole in the hearts and create a necklace. The kids really liked this one and most of the necklaces were given their mothers-Awww! 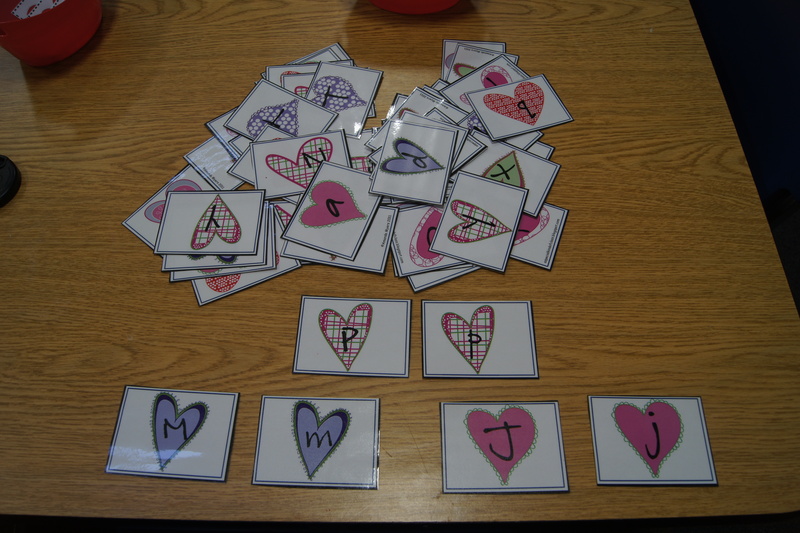 Matching The Upper and Lower Case hearts together-For this center, I printed off all 26 upper and lower case letters (and laminated them) and the kids had to match them together. I found that this was a bit much. There were a ton of letters. 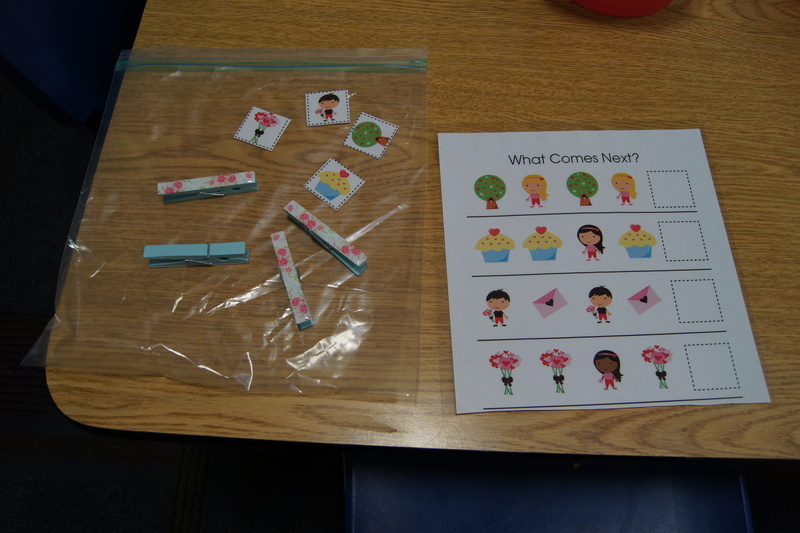 I suggested that the parents find a couple matches and play memory and try to find the pairs. Worksheet Station. I had a bunch of the sheets from Over The Big Moon printed out and colored pencils available for kids to use. I printed off the “Find the Difference” and “Pre-Writing” sheets. I also printed extras so parents could take them home and work on them. Valentine Sort. 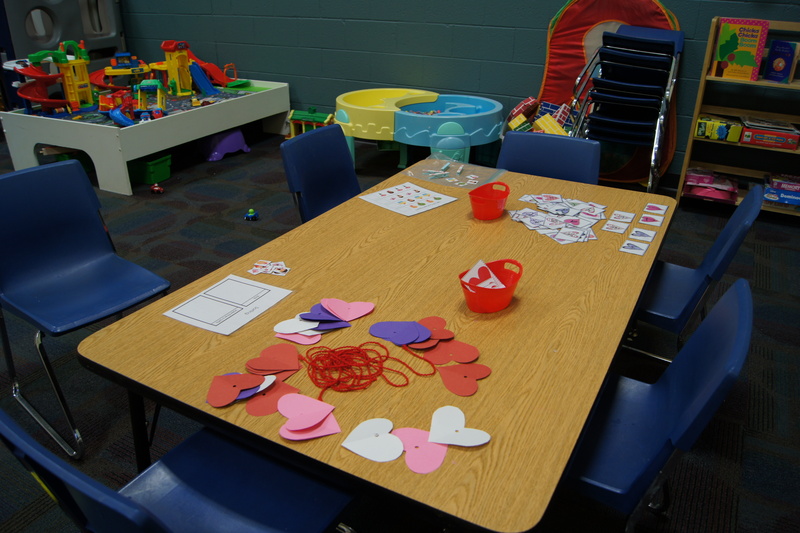 Another activity from Over the Big Moon, the kids have to sort children and Valentine gifts. 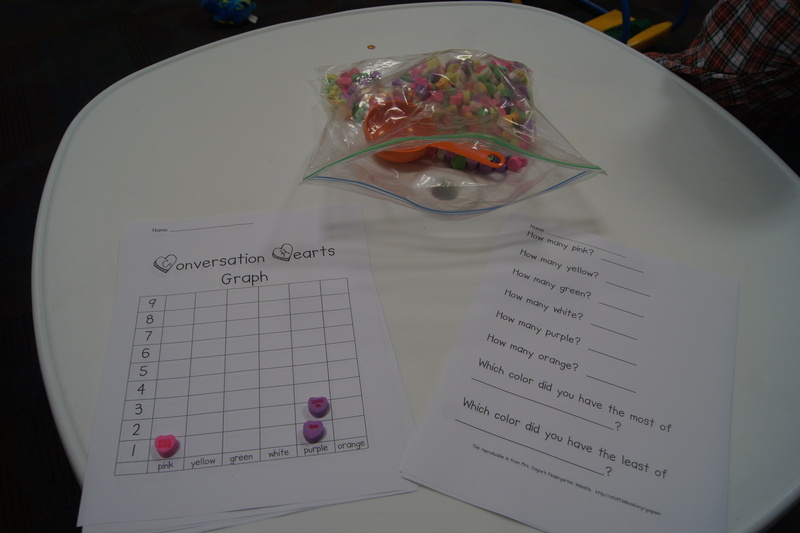 Graphing with Conversation Hearts. I bought a bag of the hearts and put them in a bag with a scooper. I printed off a graphing sheet that I found here. I also printed a sheet to analyze the information found. 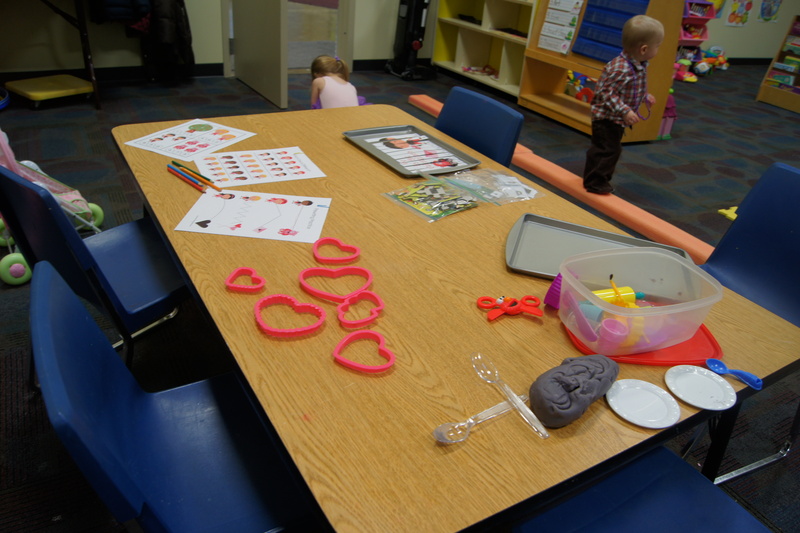 When a child came to this station, they took a scoop of candy and sorted the candy by color. They laid the heart directly on the chart. When finished, they decided which color they had the greatest amount and which they color they have the least. Arctic Animals Slides on Laptop. 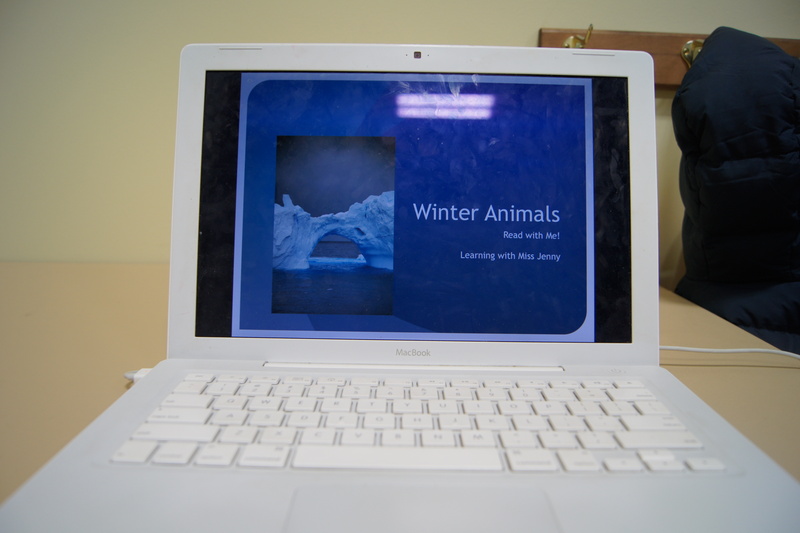 Ok, this may seem a bit weird, but I forgot that I made a slideshow on PowerPoint about different Arctic animals for last week’s class and I forgot to have it available to the kids-oops! I put pictures and text to go along with different Arctic animals and I had it set so kids push a space bar to advance the pictures and the text. 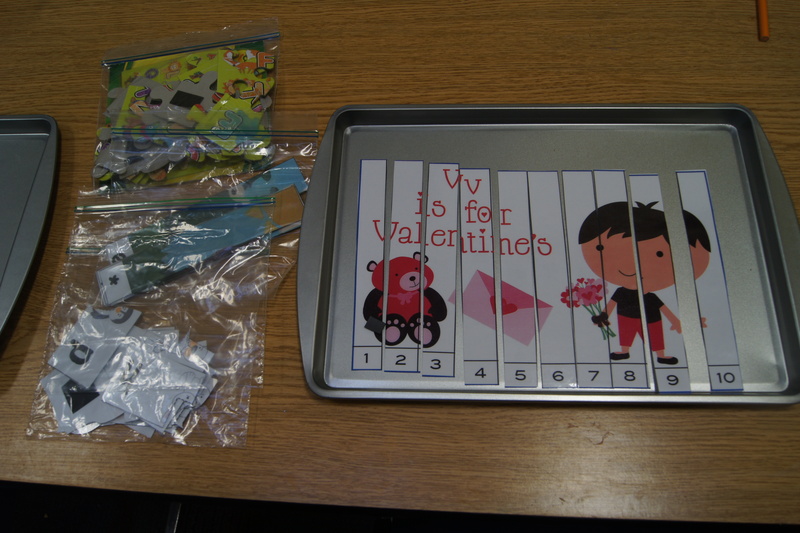 I also had an assortment of Valentine books available for the kids to read, play dough (grape flavored from Kool-Aid), and magnetic puzzles. First, we took whichever four colors the kids wanted for the arms and legs. Then we folded them accordion style. We glued those to the body. Then we glued the hands and feet, mouth and eyes. Here is what the end result looked like. My class this week focused on the clothing that we need to wear in the winter in order to stay warm in cold temperatures. If you would like to see my guidelines for planning my class check out my link here. Enjoy! The book is a simple tale of a little girl who has one of her mittens and needs to find the other one. 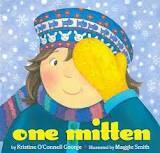 She shows the readers different activities that you can do with one mitten and then what you can do with two. The book was very cute and the kids could make little mittens out of their hands and act it out. and a big red bow. and it shone all day. One little snowman melted away. I have Animals Should Definitely Not Wear Clothing By Judi Barrett available for the kids to listen to.